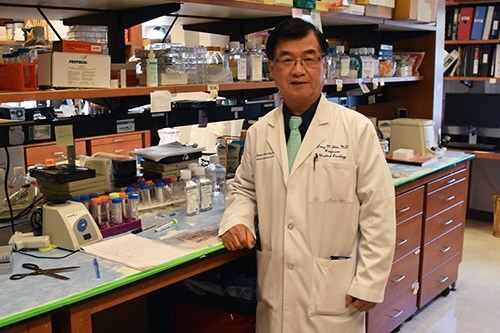 Dong Moon Shin, MD, the Frances Kelly Blomeyer Distinguished Endowed Chair in Cancer Research at Winship Cancer Institute of Emory University, has been named a Fellow of the American Association for the Advancement of Science (AAAS). Shin is a professor of hematology and medical oncology, professor of otolaryngology, and professor of biomedical engineering at the Emory University School of Medicine. He is also the director of the Head and Neck Cancer SPORE Program at Winship. Election as a AAAS Fellow is an honor bestowed upon AAAS members by their peers. This year 391 members have been awarded this honor by AAAS because of their scientifically or socially distinguished efforts to advance science or its applications. New Fellows will be presented with an official certificate and a gold and blue (representing science and engineering, respectively) rosette pin on Saturday, Feb. 18 at 8 a.m. at the AAAS Fellows Forum during the 2017 AAAS Annual Meeting in Boston. This year's AAAS Fellows will be formally announced in the AAAS News & Notes section of the journal Science on Nov. 25, 2016. As part of the Section on Medical Sciences, Shin was elected as a AAAS Fellow for his distinguished contributions in the field of carcinogenesis, molecular-driven preclinical and clinical chemoprevention and therapeutics for cancers, and anti-cancer drug development by nanotechnology. Shin, a Georgia Cancer Coalition Distinguished Scholar, is a graduate of Yonsei University College of Medicine in Seoul, Korea. He completed his residency at Cook County Hospital in Chicago and his fellowship at The University of Texas, M.D. Anderson Cancer Center in Houston. The AAAS is the world's largest general scientific society, and publisher of the journal, Science as well as Science Translational Medicine, Science Signaling, Science Advances, Science Immunology and Science Robotics. AAAS was founded in 1848, and includes nearly 250 affiliated societies and academies of science, serving 10 million individuals.